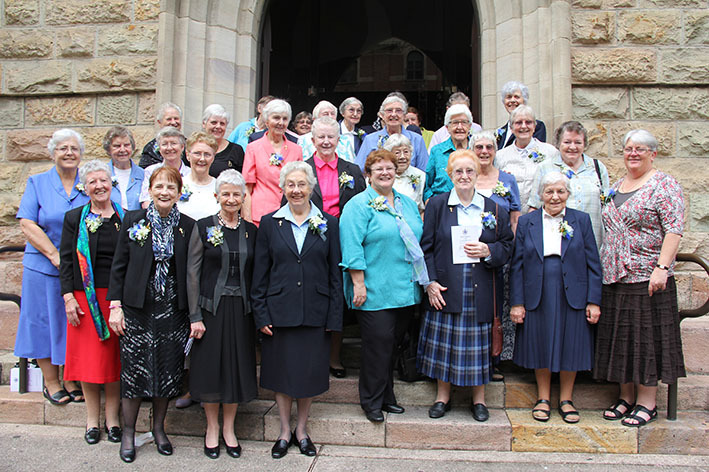 Women of charity: Queensland members of the Sisters of Charity of Australia gathered on the steps of St Stephen’s Cathedral in gratitude 175 years in Australia. This is Archbishop Mark Coleridge’s homily from Mass in St Stephens’s Cathedral on May 31 for religious celebrating the 175th anniversary of the Sisters of Charity of Australia. THE word “charity”, in contemporary English at least, gets a bad press. We even have an expression like “as cold as charity”. Yet, regardless of the bad press, the word “charity” is absolutely fundamental, not just to this celebration, but to Christianity itself. In some ways the most basic cry of all of Christianity is “God is love”. “Deus caritas est” – God is charity. What an extraordinary statement, but there is the truth. If I might sound just a touch professorial let me say that the Greek language has three words for what we call love: “Eros”, which is love under its aspect of desire; “philia”, which is love under its aspect of friendship, and then finally “agape”, or “caritas” in Latin, which is love under its aspect of self-sacrifice. When St Paul says, in the words that become the motto of the Sisters of Charity, “Caritas Christi Urget Nos” what he means is that charity drives us on. The self-sacrificing love of Jesus, crucified and risen, is what impels us. It is certain that it was that power, which we call charity, not in the least bit cold, in fact ablaze with the power of the divine love, is precisely the charity which drove Mary Aikenhead when she founded the sisters in 1815. It’s the same power that we call charity which drove the five young sisters to volunteer in 1838, in answer to the very young Archbishop Polding’s call. The call to come and work, to serve the Gospel, to minister the love in what was called the most neglected portion of the Catholic world. These women said “yes” – Mother Margaret John Cahill, Sr Alicia John Baptist De Lacy, Sr Eliza Francis Xavier Williams, Sr Catherine Frances de Sales O’Brien and the one Englishwoman of the group, Sr Julia Lawrence Cater, who would return to Europe in 1846, never having settled. The sisters, we have heard, were known as “the walking nuns” because they would not be cloistered. They would go out where the people were. Yet once these women said “yes” to the call to come to the end of the earth the walking nuns became the sailing nuns in ways they scarcely could have imagined when they volunteered. We have heard the story of Mary, the mother of the Lord going to the hill country of Judah baring new life in her womb. The five Sisters of Charity came to these shores also bearing new life, the life which is in the Lord. Mary gave birth physically to the Saviour, but in a thousand ways the five sisters gave birth to the salvation which is only in Him. They gave birth to hope in a world that seemed at times unspeakably hopeless. It was the pits. They gave birth to joy in a world that was often so joyless. They gave birth to love – charity – in a world that was often so deeply loveless and brutal. Ever since the days of those five first sisters, the Sisters of Charity of Australia have done exactly the same. They have been in all kinds of ways mothers to this nation – mothers of hope, mothers of joy, mothers of love and sisters to all. Today with the whole Church, on this day of the feast of the Visitation, the sisters sing the Magnificat, Mary’s song of joy. The Magnificat proclaims a strange vision of God, the real God, who overturns every seemingly non-negotiable status quo, even the most seemingly non-negotiable of them all, death, when Jesus rises from the dead. Mary’s vision is the vision of a God who casts the mighty from their thrones and raises the lowly, who fills the starving with good things, sends the rich away empty. The God who overturns all the seemingly non-negotiable status quos but it is love, it is the charity of God which is the power that overturns all the old death-dealing status quos of which early Australia was a symbol. This is the love that is power – the love that leads to action, and the sisters have been nothing if not mightily active. They were founded to be universally useful and they have been at least that. They have done many things, hospitals and schools certainly and obviously, but a host of other things as well, many of them far less than obvious. Yet at the heart of it all the sisters have done only one thing for 175 years, what they have done is charity, the self-sacrificing love. They have “done” God. These five women, the first Sisters of Charity, were also the first women religious to come to these shores, and the historic significance of that is inestimable. The Congregations of Apostolic Women Religious have in fact been, in Australia, the prime evangelisers. One thinks immediately of the Sisters of Charity, but also and inevitably of the Sisters of Mercy, the Sisters of St Joseph and so on it goes. We owe these women an un-payable debt of gratitude, and when I say “we” I don’t just mean the Church, for that is stating the obvious, but Australia owes these women, the Sisters of Charity, an un-payable debt of gratitude. Without the seminal contribution of apostolic women religious in the Catholic Church, Australia would be unrecognisably different and a far more brutal place. How right it is then that we gather to say thanks to the sisters for all that you have been, and the sisters before you. What a contribution. In the end the dimensions of it are known only to God and it is to God we say thanks for the 175 years. It’s why we gather in this cathedral and around this altar of the sacrifice and the feast, to say with the Mother of God, to say with the first five sisters, with Mary Aikenhead and all the Sisters of Charity who have followed them in this land; “My soul glorifies the Lord, my spirit rejoices in God my saviour”.